When you compare multiple data groups, you can use either stacked or side-by-side charts to see trends. Stacked mode (default) shows combined totals and trends among the compared groups. Side-by-by mode shows trends on a shared baseline, enhancing comparison between groups. This mode applies to across the dashboard, so all charts will be using the same chart mode. Let's use a dataset of homicides as an example, and compare trends across three regions (quadrants) in a city: SE, NE, and NW. Stacked charts show compared regions stacked on top of each other, also revealing their combined trend. Side-by-side charts show compared regions on the same baseline, enabling side-by-side comparison of selected regions. Stacked and side-by-side charts also adjust to relative distributions! 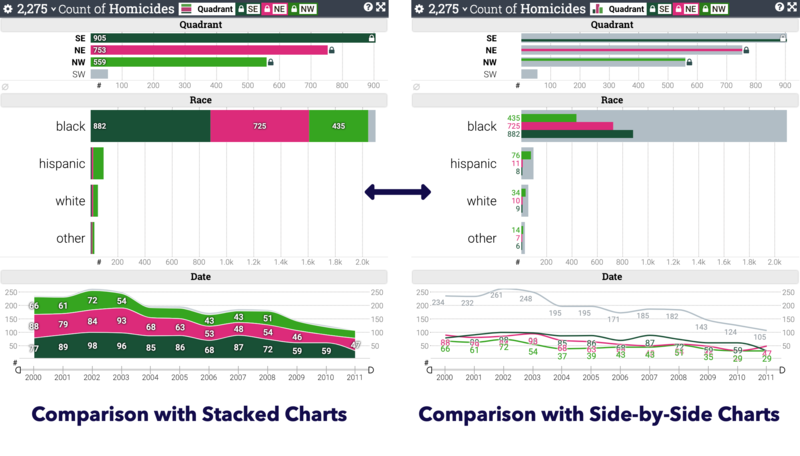 The example below shows the relative distribution of homicides in three quadrants as above, but this time revealing relative distribution of quadrants across race and time. Stacked charts highlights the breakdown of different geographic distribution, and the viewer will focus on the higher-level trends. 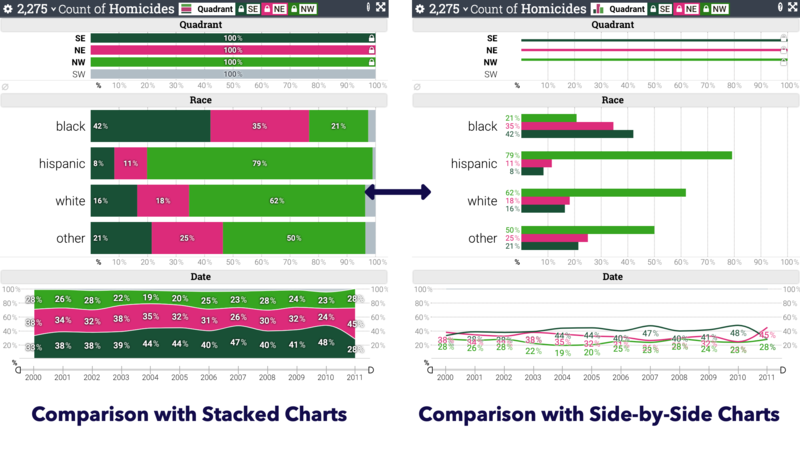 Side-by-side charts allows accurate comparison across compared regions per race or year. Example: You cannot stack average age of different groups of people. A multi-valued categorical attribute is used for comparison. Example: You cannot stack people who like apples and people who like oranges. There are some people who like both, so the sum will of the both groups would not be correct. This design prevents misleading analysis with combined totals when some data points can appear multiple times in selections or when data points contribute negatively to the total.